This module taking place in the Southlands of Midgard clocks in at 26 pages, 1 page front cover, 1 page editorial, 1 page SRD, 1 page advertisement, 1 page back cover, leaving us with 21 pages of content, so let’s take a look! All right, still here? Great! right outside the absolutely amazing metropolis of Per-Bastet (one of my favorite fantasy cities of the last 5 years…), there supposedly lies hidden and sunken Anu-Asir, which has recently emerged from the sands and became a kind of hub…and not far from it, there is the eponymous Tomb of the self-proclaimed god-king Tiberesh. The PCs are hired as an archaeological team by the Golden Falcon Antiquities (GFA), an organization which looms over the frontier-expedition outpost. The module begins with the negotiation of the exploration of the tomb, though the offer itself is actually rather generous. A total of 3 sketches for alternate lead-ins into the module can also be found in the pdf, should you dislike the angle, though, as we’ll come to see, I’d strongly suggest running with the GFA-angle. The tomb of Tiberesh’s exploration would be up next and the small dungeon does feature a side-view of the pyramid and a rather evocative full-color map (2 such maps are provided), though they only come in 1/2 page size, which is a pity: Considering the rather beautiful renditions and their details, one-page hand-out style maps sans keys, you know, that you can print, cut up and hand to the players, would have been a great type of icing on the cake. But back to the subject matter: Unlike quite a few modules with a similar angle, there is actually a lot of indirect storytelling about the fish-headed pseudo-deity Tiberesh going on in the exploration of the complex and the place even features alternate means of ingress, which is a neat touch. Similarly, the PCs will not only meet the forgotten – they will meet intruders, find rooms used to extract venom for medicinal purposes and test their mettle against gnolls…and nkosi in stasis. What are Nkosi? They are challenge 1/2 feline hunters and shapechangers and get their own, gorgeous artwork reproduced for your convenience herein. The interesting component and what makes this a good example of a tomb exploration, si due to the fact that aforementioned indirect storytelling can be employed by clever PCs to deduce the sequence required to e.g. open a specific sarcophagus via a unobtrusive puzzle. Similarly, there is a classic “seal itself”-room trap that features some seriously nice teamwork options required to survive it once it is triggered. In order to find the true heart of the tomb of Tiberesh, the PCs will have to brave another puzzle that blends knowledge of symbolism with what the PCs have learned exploring the complex. Once the true heart of the complex is unlocked, the tomb turns decidedly sinister – the weird iconoography is one-upped; color and symbols become more threatening…and ultimate, the PCs will stumble into the alabaster hall, which seals itself with fire, to face of against the unique mummy (stats and artworks provided) of the man who thought himself a godking and his retinue. At challenge 3, he is a powerful adversary and the pdf does feature no less than 4 magic items that are generally well-crafted. Regarding the finale…well, GFA, as per default, is actually seeking to reanimate Tiberesh and thus won’t be too happy, providing an unpleasant surprise…but the alternate means of concluding the module, while brief, make for nice alternate means. One further gripe I have: The leaders of the GFA do not get stats in this module, when at least two of them may be part of the epilogue encounter. Editing and formatting are top-notch, I noticed no glitches. Layout adheres to a drop-dead gorgeous two-column full-color standard and the pdf sports numerous, absolutely amazing full-color artworks, which, fans of Midgard may recognize from previous Southlands books, though. The pdf’s cartography is great, but I would have loved 1-page, player-friendly versions. The pdf comes fully bookmarked for your convenience. 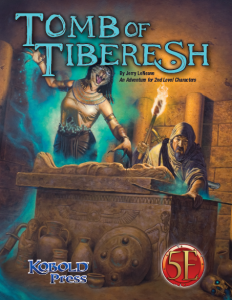 Jerry LeNeave’s Tomb of Tiberesh is a great example for an unpretentious, nice tomb-exploration that does its indirect storytelling rather well. It has some highlights regarding the things you explore, both regarding combat, traps and flavor and the progression of its layers is nice. The relatively easy puzzles and the nice retributive hazards for failing as well as the cool boss make for an overall rewarding tomb exploration. Apart from the epilogue encounter and the lack of player-friendly maps, there is not much to complain about here – and hence, my final verdict will clock in at 4.5 stars, rounded down to 4 for the purpose of this platform. You can get this nice module here on OBS or here on tabletoplibrary.com!